Nothing beats the sweet and salty taste of county fair kettle corn. 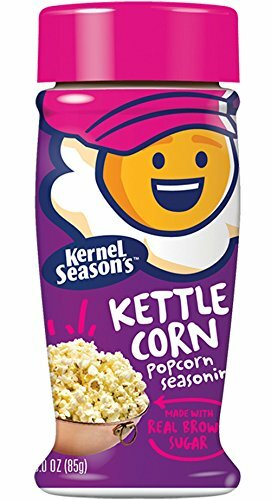 Made with real cane sugar, our Kettle Corn popcorn seasoning lets you capture that flavor at home. Nutrition: Serv. Size: 1/4 tsp. (0.8g). Servings per Container: 85, Amount Per Serving: Calories 3, Total Fat 0g (0% DV), Trans Fat 0g, Sodium 100mg (4% DV), Total Carb. 0g (0% DV), Sugars 0g, Protein 0g. Not a significant source of other nutrients. Percent Daily Values are based on a 2,000 calorie diet.